Proper care of the body is essential in balancing the three basic principles of the human body Vatha, Pitha and Kapha. Purifying and immunizing the body, reducing ageing processes, minimizing stress, slimming, beauty care etc. 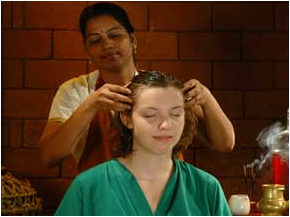 are all made possible by suitable Ayurvedic treatment. Euro 25 This massage includes whole body massage with herbal oil or herbal powder by hand and foot, head massage, face massage for one and half hours. Euro 22 Body massage with herbal oil or herbal powder by hand to tone up the body and to improve the blood circulation etc. Euro 10 / Session Duration of the treatment may vary according to doctor’s directions with the corresponding changes in rates.